Fundraising 101 Guide This entry was posted in Blog and tagged fundraise, fundraising 101, team sadie, web page. 3) Let people know exactly what your personal fund raising goal is and that the overall Team Sadie 2014 goal is to fully fund the endowment for the Johns Hopkins Children’s Center in Sadie’s name at $1,000,000 by 2016 (total raised to date is over $500,000!). People love to help other people reach their goals and as such feel a part of something larger then themselves which they are when they donate on your behalf. As you may remember, on October 18th I am going to be running a 5K as part of Team Sadie, a group of friends and family who are working together to gather donations for Sadie’s Gift. Jason and Amy Abell established Sadie’s Gift after the death of their three-day-old daughter in December 2006. The Abells’ have honored Sadie’s life by establishing an endowment in her name at the Johns Hopkins Children’s Center. This endowment already successfully supports the training program for doctors who care for critically ill children in the Pediatric Intensive Care Unit (PICU) along the east coast. Thanks to the generosity of so many people, Sadie’s Gift has already raised over $500,000! However, to reach the ultimate goal of $1,000,000 by 2016 more money is still needed. With race day just 76 days away, it is my intention to not only finish preparing to run the 5K, but also to complete the task of raising money for Sadie’s Gift. I simply cannot do it without you and without your generosity. She died on December 19th of 2006 and her family and friends are going to be gathering in Baltimore for the fifth year in a row to help raise money for the Johns Hopkins University Hospital – the hospital that so valiantly tried to save her life. More than just a little gathering, however, because over 150 of us will be running, crawling or walking the Baltimore Marathon on October 18th . So as you may have guessed, this is where I tell you how you, too can be a part of this great endeavor, because we need your help. You would think that a hospital as famous as Johns Hopkins, would have endowments and grants etc… that enable it to provide the best care in the best possible environments, but sadly they do not. The Abells were awe-struck with the physicians who gave everything they had and more to save their precious daughter but noticed that there was room for improvement. Would you please support us in this great endeavor? We realize that there are so many great “causes” to give to, but if this one touches your heart, I would kindly ask you to click on my personal fund raising page at (insert personal fund raising link here) and give as generously as you can to this great cause. I will be running the 26.2 miles on October 18th and my training for this marathon has already begun. It is my goal to raise north of $10,000 personally and every penny we get counts. If you can give $1 a mile or $100 a mile or anything you feel led to give, please know that it helps my every step, but much more importantly, your donation gives hope to the Abells, to the doctors and nurses, and mostly to every sick child that will benefit from this endowment. There is much more written about Sadie’s story on the website so please go there and read all about it (www.sadiesgift.org). I am writing to let you know that I have joined a group of women who will be running as a relay team in the Baltimore Marathon on Saturday, October 18th. 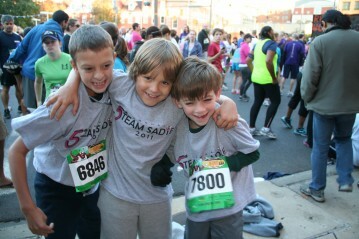 Our team, “Ladies for Sadie,” is running for Sadie’s Gift, a non-profit organization established to raise money for the Pediatric Intensive Care Unit at the Johns Hopkins Children Center. The initial goal (successfully achieved in 2007) of Sadie’s Gift was to raise $100,000 for the new Children’s Center being built at Johns Hopkins. To date, over $500,000 has been raised and the ultimate goal is to raise $1,000,000 by 2016 in Sadie’s memory via the Sadie Elizabeth Abell Endowment for Pediatric Critical Care Simulation Training be used for doctors who care for critically ill children in the Pediatric Intensive Care Unit (PICU) along the east coast. I will be running the Baltimore Half-Marathon on October 18, 2014 in memory of Sadie Elizabeth Abell.